This week is fast turning out to be a week of sequels. 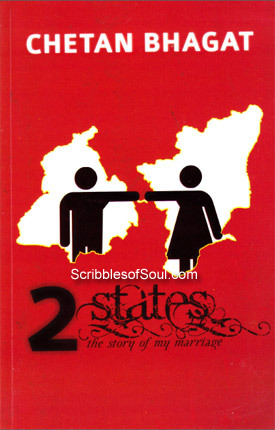 I had hardly finished the trilogy of R.K. Narayan that I laid my hands on ‘2 States:the story of my marriage’ by Chetan Bhagat. Yes, whether it was advertised as such or not, ‘2 States’ is definitely a sequel of ‘Five Point Someone’. Here, the story of IIT graduate Hari is carried forward, who is now Krish, sitting in front of a shrink in Chennai. Krish is on the verge of nervous breakdown and has given up on life for good. As the charming physiotherapist convinces him to talk his heart out, a wonderful story begins, predictably in an Institute, and this time the honour goes to IIM Ahmedabad, where our Hero is standing in a queue in college canteen, gawking at beautiful Ananya Swaminathan who is arguing with the cook over the quality of sambhar! One thing leads to another and Krish and Ananya become the hip and happening couple of geeky IIMA, grabbing eyeballs with their bold live-in relationship. They are madly in love with each other and are committed for life. However, as soon as the college is over, and they go separate ways to solidify their respective careers and earn lots of money, the reality dawns on them. They find out that though they are perfect as a couple, their families are just opposites. They not only belong to different castes, but are also from different states, cultures and backgrounds. While, Krish is the handsome Prince of large-hearted Punjabis, Ananya is the queen of dark-complexioned, reticent Madrasis, and their families are as compatible as lassi with coffee! While Punjabis revel in their loud humour and larger than life attitude, Tamilians are proud of their educated, cultured background. One believes in trumpeting their achievements, the other is a firm believer of dignified silence. One is a chaperone of vegetarian sanctity, the other is a guillotinous tandoori lover. And caught between this crazy fight of lassi v/s coffee is the innocent, pure love of Krish and Ananya. Will they ever be able to patch up the glaring differences among their families or will their love be sacrificed on the alter of caste, culture and society, is what forms the basic story of this six acts and 269 pages long novel of one of the bestselling novelist of modern India. The novel documents the journey of dreamy eyed lovebirds to legally married inter-state couple, and is rippling with inevitable heart-breaks, emotional drama and tear-jerking speeches. And, as a good Hindi movie, every character plays his role convincingly, in a matter-of-fact manner, with just a blob of dramatic overtures thrown in for good measure. So, you must be wondering that the story is crystal clear, it seems nothing better than a reverse-role script of ‘Ek Duje Ke Liye’ that has been milked so many times that there is hardly juice left in it, Right? Well, the answer is a big No. In the hands of a perfect Italian Chef, humble khichdi is transformed into exotic Rissotto, and, the easy conversational English of Chetan does modify the boring, age-old story into an entertaining saga. His witty one liners and a light-hearted approach towards life, aids a lot in making the novel an amusing read. I especially liked the first three acts, Ahmedabad, Delhi and Chennai. Chetan seems to be at his best in these three parts. He builds up a great drama without even once faltering in the entertainment department. His antics in wooing his girlfriend and her family, and at the same time blackmailing his Boss Bala were simply hilarious. Since, I almost liked the novel, I am going to first list out the positives, before moving onto the glaring shortcomings. For starters, I really liked the Prologue. It gave a definite structure and a good beginning to the story. Unlike ‘Five Point Someone, it provided the basic framework, on which the novel would be built up, instead of just a copy-paste job out of forthcoming chapter. Secondly, I liked the continuation of story from ‘Five Point Someone’, be it the missed convocation ceremony, the hurried last act, or sharing a car with your girlfriend’s father, the connections were noticeable and comforting as good memories. To give Chetan due credit, he did a good job at tying up all the loose ends. He took care of Neha Cherian, and replaced her with even bolder Ananya Swaminathan. The parental issue Hari had in previous novel, are given a due explanation in Krish’s spat with his father. And, I have begun to like Chetan’s practical approach towards telling stories. He simply concentrates on an event without wasting time in talking about the place, town or time. Given his background, he does make a good job of minimizing overhead costs, while still not compromising on the quality of product. And, thankfully, Chetan kept the entire narration first person and wrote the novel from Krish’s point of view, which essentially suits a biography. The continuous chain of thoughts was not at all broken with futile soliloquies or boring letters, as attempted in Five Point Someone. So, essentially, I feel almost all the shortcomings that irked me in his previous novels, were ironed out and I must be elated with this novel. But, sadly perfection is a tricky road. And, though Chetan has improved by leaps and bounds, a few nit-pricks still hold his path. Firstly, I feel that the parental issue was blown out of proportion and I simply could not digest that Swami episode, acting as a catalyst in breaking ice between father and son. In a philosophical novel by Narayan, the spiritual approach of solving a problem may work, but it has no place in a practical, matter-of-fact style popularized by Bhagat himself. It just does not suit his genre. Add to it, I found the character of Ananya and her family, a bit too head-strong. Though, the author takes pains in presenting them in as good light as possible, it does nothing but accentuate the second-hand treatment levied on the groom’s family. In fact, I liked the book till Chennai Act, and was not able to put it down for a minute.But, as soon as Delhi Reloaded began, my interest began to dwindle. I felt as if the subsequent acts were not written with as much soul and emotions, as were the earlier ones. The Punjabis are acknowledged as one of the most fun-loving communities of India, and given the framework, Chetan had ample opportunities to create comic and hilarious episodes. Instead, he chose to present them as boasting, shallow, uncouth creatures, with the result that the narrative lost its sheen and became boring and choppy. And, thus missed out on all the fun factor and a considerable North-Indian readers. Last but not the least, Chetan has still not overcome his habit of making climax a bit too predictable and boring. Since, the title itself suggests that it is a story of his marriage, and as such the wedding should have come across as the biggest and most entertaining event, but, God knows why, he chose to stress on just the rituals and made them boring and unimaginative like a documentary, with emphasis on just getting the act done, without putting any real fun in it. I think, his practical approach led him down once again, and I was, left unsatisfied with a disappointing climax. However, all said and done. ‘2 States’ is a good time-pass, and till at least the middle, I definitely enjoyed reading it. Though, it leaves much to be desired, and can hardly be considered as gratifying, the novel could be an amusing one-time read. It was great reading this best-seller book from Mr.Chetan Bhagat. Truly caught the nerve of a youngster. No wonder if you finish a book in 2 days. Bhagat keeps you digging in the story everytime you try to leave. I would definately recommend this wedding novel to my friends. the first and the best novel throughout my entire life………………..It was an awesome experience especially for a teenager like me…………….